ABC Commercial has announced the recall of one of its children’s toy products in its Giggle and Hoot range. A product safety recall is being undertaken for the Lullaby Hoot Interactive Plush Toy and the Australian Competition and Consumer Commission has been informed. The screw which holds the battery compartment cover in place may become loose, potentially enabling a child to access the batteries, which could pose a safety hazard. There have been no reported injuries regarding the use of the Lullaby Hoot Interactive Plush Toy. ABC Commercial took the decision to recall the product to ensure that the safety and quality of its products continues to meet the very highest standards. 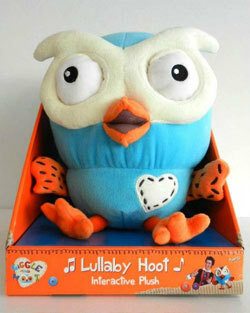 The Lullaby Hoot Interactive Plush Toy went on sale in September 2011 after testing showed that it complied with the mandatory product safety standard for toys of this type. The Lullaby Hoot Interactive Plush Toy is distributed in Australia under licence from ABC Commercial by Jasnor Australia Pty Ltd. There are more than 200 products in the Giggle and Hoot range which include DVDs, CDs, books and clothing. ABC Commercial is currently in discussion with Jasnor to replace the current Interactive Plush with a new design. Customers should return the Lullaby Hoot Interactive Plush Toy to the place of purchase or to any ABC Shop and will be reimbursed the full purchase price. Customers can call 1300 360 111 or visit the website www.abcshop.com.au/recall for further information. ABC Commercial apologises for any inconvenience caused to the many fans of Giggle and Hoot around Australia.